Cooper arrived at the shelter today. 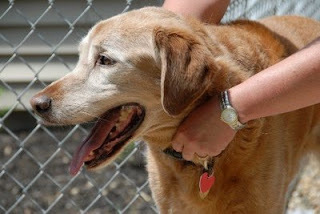 We took him in from the Palmer, MA dog pound to increase his chances of finding a loving home. After a stop at the vet for a check up and to have his vaccines, he had a bath and then proceeded to charm our volunteers with his adorable personality, calm demeanor and good behavior. He was clearly a family pet at one time as he knows commands, walks well on the leash and can be loose in our lobby since he isn't at all destructive. As always, we are flabbergasted that he was never claimed by an owner. This is a dog who will make a seamless transition into a new home since he is already trained and so well-behaved. Who needs a puppy when you can adopt Cooper?